Happy National Ice Cream Month! Do you ever feel a sharp zinger of pain in your teeth when you eat ice cream? 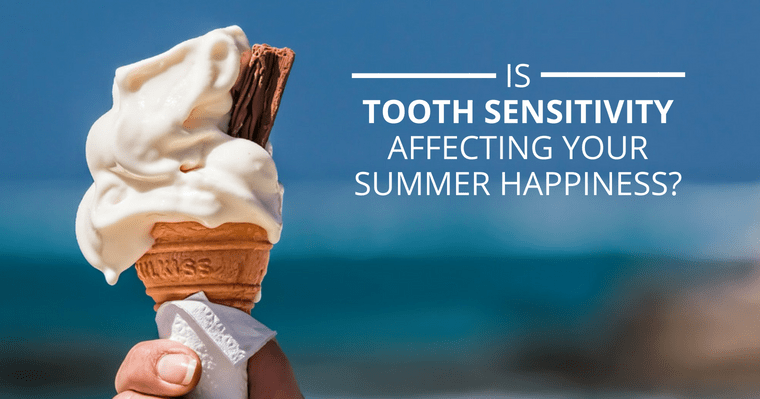 July is National Ice Cream Month, so let’s talk about how to get rid of tooth sensitivity, a dental problem we help our patients with here at The Gorman Center for Fine Dentistry. Flashes of tooth pain can surprise you when your teeth are exposed to air, cold, sweet, acidic, or hot foods. Even brushing or flossing your teeth can sometimes trigger sensitivity. Enamel protects the tooth and the gums protect the roots of teeth to prevent sensitivity. When enamel wears down or when the gum line recedes, then the dentin is exposed, which is connected to the nerve that triggers the pain in sensitive teeth. Avoid hard-bristled toothbrushes which contribute to gum recession and loss of enamel. Instead, use a soft-bristled brush. Brush lightly and slowly to avoid gum recession and exposure of the dentin. Fluoride toothpaste that contains a desensitizing agent can be used to protect the enamel and root surfaces of your teeth. Before a professional tooth-whitening treatment at the dentist, you may want to use a sensitivity formula toothpaste for two weeks before treatment, allowing potassium nitrate to sooth the tooth nerves. Symptoms of sensitive teeth will come and go, sometimes lessening or going away for a while, but will never completely get rid of tooth sensitivity unless the reason for the sensitivity is eliminated. Dr. Gorman will diagnose the reason for the sensitivity in your teeth. He can determine the most effective treatment and solution to your sensitive teeth, whether that is restorations (crowns, veneers, onlays, inlays), fluoride gel or varnish, gum treatment, root canal, or even some techniques that can be performed at home. Desensitizing toothpaste. Try a few different brands until you find one that works best for you. It is important to use fluoridated toothpaste for sensitive teeth, not tartar-control toothpaste, and you may also try spreading a thin layer of the desensitizing toothpaste on the exposed tooth roots before going to bed. Stay away from overexposure to highly acidic foods. Use fluoridated mouthwash every day. Consider a mouth guard if you grind your teeth. Overall, it is vital to practice thorough oral hygiene at home by flossing at least once a day as well as brushing with toothpaste that contains fluoride. This goes hand-in-hand with the importance of hygiene visits for scaling and polishing every six months or as recommended. Visit Dr. Gorman to get rid of tooth sensitivity for good! We are here every day to answer your questions about tooth sensitivity. Please give The Gorman Center for Fine Dentistry a call. We love to answer questions! Our patients trust Dr. Gorman’s years of experience and knowledge. Click here or call 651-483-5134 today to schedule an appointment with Dr. Gorman to discuss your options to reduce sensitivity and to uncover the best way to eliminate the pain. 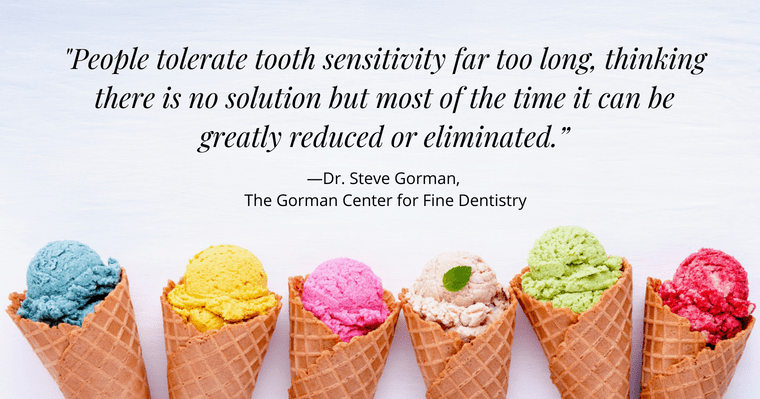 Dr. Gorman wants to help you discover the cause and find the solution to put an end to your tooth sensitivity today so that you can enjoy that ice cream cone on a hot summer day!